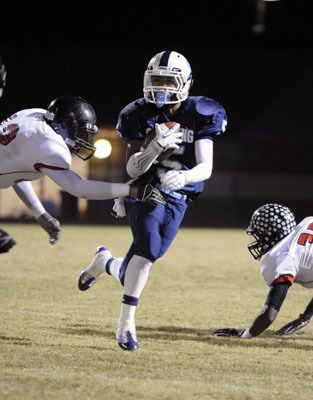 DAVID BECKER/LAS VEGAS REVIEW-JOURNAL Canyon Springs' Donnel Pumphrey finds an open hole between two Las Vegas Wildcats during his football game at Canyon Springs High School on Thursday, Oct. 27, 2011. 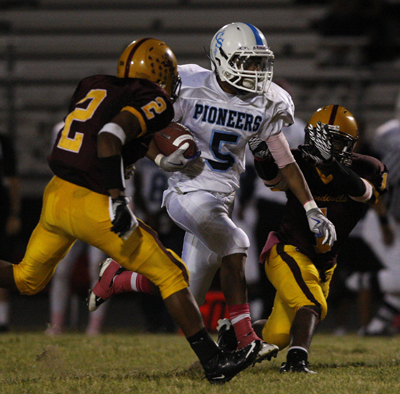 JESSICA EBELHAR/LAS VEGAS REVIEW-JOURNAL Canyon Springs Donnel Pumphrey (5) drives past Canyon Springs players during the Eldorado Vs. Canyon Springs football matchup at Eldorado High School on Oct. 8, 2010. College football coaches look for many qualities when recruiting running backs. One player who might have nearly every box checked off is Donnel Pumphrey, who will be a senior at Canyon Springs this season. UNLV, Duke and San Diego State have lined up with scholarship offers for Pumphrey, and Oregon, Oregon State and Utah are showing interest. The 5-foot-9-inch, 170-pound Pumphrey is an elusive but durable runner. He rushed for 1,647 yards and 22 touchdowns as a junior on his way to second-team all-state honors as the Pioneers (7-3) won the Northeast League title. "My strengths are really my vision, my quickness," Pumphrey said. Pumphrey runs the 40-yard dash in the 4.4-second range, but his GPA (3.7) also is an impressive number. He plans to choose a college after his senior season. Legacy defensive end Randy Ricks also said he plans to commit after his senior season. He has offers from Idaho, New Mexico and San Diego State. The 6-4, 215-pound Ricks was a first-team All-Northwest selection as a junior. "Most of the (college) coaches talk about my speed and my aggressiveness," Ricks said. The 2013 class has a chance to be the biggest blockbuster group locally in recent memory. Locals already committed include Bishop Gorman quarterback Jarrett Solomon (Arizona), Centennial linebacker Trajan Pili (Brigham Young), Foothill safety Tyler Morris (San Diego State), Liberty running back Niko Kapeli (UNLV) and Liberty linebacker/safety/quarterback Kai Nacua (BYU). TAYLOR HONORED — Rancho senior-to-be receiver/defensive back Xavier Taylor won a National Leadership Grant sponsored by the NFL Players Association and NCSA Athletic Recruiting. The grant is awarded to athletes who qualify based on community leadership, academic and athletic achievement, and a written essay. COACHING CHANGES — Palo Verde hired longtime assistant Paul Sanchez as its boys basketball coach to replace Jermone Riley, who took an assistant coaching job with Northern Arizona. 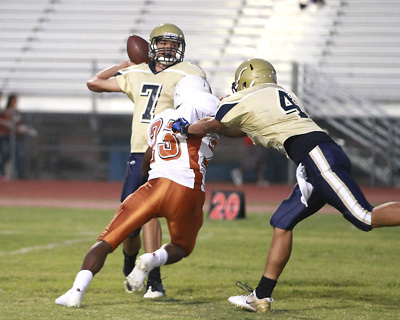 Other programs with new coaches include Bonanza boys basketball (Eric Markuson), Boulder City baseball (Bobby Reese), Agassi Prep football (Deumaine Reeder) and Mountain View football (Mike Valenzuela). BUSY WRESTLERS — Las Vegas High coach Greg Gifford will lead a local group of wrestlers to the ASICS/Vaughan Junior & Cadet National Championships, which begin Friday at Fargo, N.D. Among individuals going are recent graduates Jordan Hart of Palo Verde and Bronson Ashjian of Cimarron-Memorial. Hart, the 120-pound state champion in February, recently signed with Drexel. Ashjian, who won the 132-pound state title as a senior, committed to Penn State. Green Valley’s Josh Temple (120) and Ryder Newman (160), Cimarron’s Adrian Avelar (120), Austin Beaman (170) and Austin Sinyard (heavyweight), Las Vegas’ Alex Aniciete (145), Palo Verde’s Kyle Leet (138) and Arbor View’s London Thomas (132) are among other wrestlers headed to the event. "I’m pretty excited. We’re looking forward to it," Gifford said. "They’ve been training hard for the last five weeks. They’re all in shape, and hopefully they can all perform." JUST WIN, BABY — Findlay Prep senior-to-be guard Nigel Williams-Goss scored his team’s final five points, all on free throws, to help Team Georgetown rally for an 80-77 victory over Team Michigan State in the title game of the LeBron James Skills Academy on Monday at Rancho. Williams-Goss, who has committed to Washington, now has two National High School Invitational titles, is 3-0 against Gorman and has titles at the adidas Super 64 and James’ event.